A Silent Retreat is the heartbeat of the sacred journey. It provides a restful environment for the deepest inquiry into the truth of one’s being, where one is dissolving into the timeless here and now. This is where profound leaps are taken in the journey of transformation. A Silent Retreat is a rare and precious opportunity to focus solely on the most earnest questions of the heart and spend some days in silence in a beautiful, natural setting. Its special power lies in the coming together of seekers in support of one another’s awakening. Participants are asked for a sincere commitment to the standard of the retreat and will remain in absolute silence until the process is brought to completion in the closing circle. A retreat is also a spiritual cleanse on a collective level, an inner shower for all of PachaMama. Non-participants help maintain a meditative atmosphere by refraining from speaking in all public areas in order for the entire village to tune into this frequency. The program includes Satsang with Tyohar twice a day, a daily practice of Yoga as well as various forms of meditation and is concluded with a Sweatlodge down by the river. PachaMama also holds High Vibe Silent Retreats, which offer the opportunity to deepen into meditative inquiry with the support of a delicious light, vegetarian menu consisting of smoothies, juices, raw foods and superfoods. The Who Is In? is required for those who wish to participate in the silent retreat. Vipassana (December retreat) or Wisdom of Breath (April retreat) are alternative options only for those who have completed a previous Who Is In? Who Is In? and Vipassana/Wisdom of Breath are not a part of the High Vibe Silent Retreats. 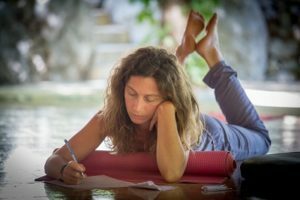 *Silent Retreats occur several time a year at PachaMama, including December and April, and the High Vibe Silent Retreat is normally in February and August. The April and December Silent Retreat are part of the Transformation Cycle but open for everyone.